Isabelle Schexnayder, NIU Dietetic Intern and volunteer for the CATCH program, points out healthy “Go” options to a student at North Elementary School in Sycamore. How do you get kids excited about health and wellness? Some NIU students have found a way to do so by “playing” CATCH with area elementary school students. CATCH, Coordinated Approach to Child Health, is a national obesity prevention program focusing on health eating, increased physical activity, and reduced screen time. 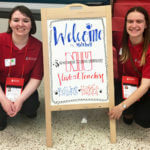 The program is facilitated by NIU student volunteers who visit classrooms in Sycamore and Genoa-Kingston school districts once a month to deliver the message. The 25-minute messages are serious, but for the students participating in the program it’s all fun and games. Younger grades participate in activities like alphabet or animal yoga, where kids learn yoga poses in the shapes of letters or animals. Older students build a human artery and become the blood that travels through it. As they eat junk food, the artery becomes comes clogged and the students get jostled around. They learn to read nutrition labels as well, and gain an understanding about ingredients. “The NIU students bring in sugar and they show students how much sugar is in soda and other foods by dumping out the amount of sugar on to a plate. The kids all go ‘whoa!’” said Lisa Winters, a third-grade teacher at North Elementary School in Sycamore. Students in all grades learn about ‘go-slow-whoa’ foods with games and activities tied to learning about them – such as doing jumping jacks when a “whoa” food like apple pie, is presented to them. 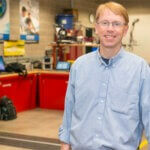 “Every lesson has some kind of engaged and interactive part where the kids are doing something. They enjoy all of them,” said Stephanie Born, a third-grade teacher at Genoa Elementary School. Savannah Peters, an NIU Dietetic Intern, said CATCH program is an important way to battle the childhood obesity crisis. She said students don’t get enough nutrition education in elementary school. She said many of the younger students have never seen a zucchini, and that some of their parents think it’s cheaper to buy chips than an apple. 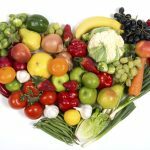 By encouraging young children to “eat the rainbow,” and teaching older kids what can happen to your heart if you eat too many unhealthy foods, they are hoping to foster healthy nutrition and wellness. 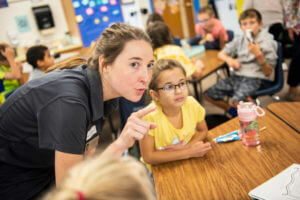 They also show kids what a dietitian is and why it’s important to seek nutritional advice from a professional. It may be working already. “I hear from parents that their kids tell them about the lessons. Students ask for CATCH, and when they hear it’s a CATCH day they cheer. They are so excited,” said Winters.